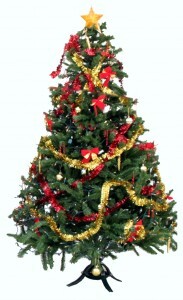 It is a great idea to clean and dry ornaments before putting them away for the season. In most cases, a damp cloth will be enough to remove any dust that has accumulated during the season. For ornaments that can’t be washed with water, reader Kerry wrote to us with this tip for cleaning ornaments. When I take the ornaments off the tree, I hang them on my indoor clothes drying rack which is placed over a towel. Then, I use compressed air to clean the ornaments so they are ready for next year! If you have any ornament cleaning tips you would like to share, let us know in the comments below. I inevitably spot one every year — a house with Christmas decorations still displayed in mid-March. 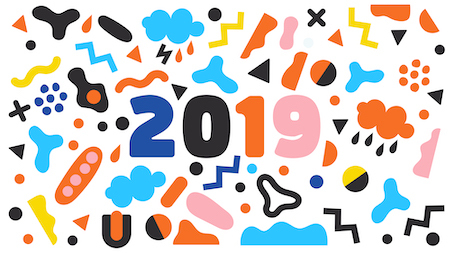 Granted, taking down decorations isn’t nearly as much fun as putting them up, but delaying the inevitable doesn’t make the process more entertaining later in the year. Lights: Gather up all of the lights in a systematic fashion. If you have misplaced the original packaging, wrap the cords around a flat square of cardboard or an extension cord wrap to keep them tangle-free. Inspect and repair: As you put away your items, inspect each piece to make sure that it is in its best working order and doesn’t pose any safety threats. 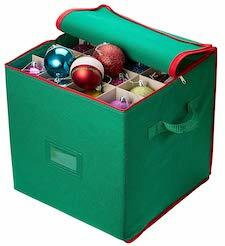 Keep all your holiday decorations together: Label all your storage boxes and keep them together in your storage space. It can be a good habit to limit yourself to a set number of boxes (in our house it is three). If you can’t fit all of your decorations into a limited space, it’s time to purge some of your items. Donate: If you need to lighten your decoration load, take the lightly used ones to a consignment shop or charity. Nursing homes also can use some festive decorations. Regardless of the charity, be sure to call before you make your donation and make sure the group is interested and able to handle your gift. What tips would you add to the list? Join in the conversation in the comments. My wife is rather thrifty. I figured this out long ago, but one of the things she is accustomed to doing is heading out to local retailers the days after Christmas to purchase deeply discounted holiday storage products. In the past, she has scored a couple of ornament boxes, a wrapping paper storage case, and she always comes back with a few new ornaments and decorations to replace ones that didn’t survive the season. 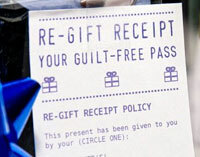 Plan out a list before going to keep you from impulsively buying items you don’t need. Try to stay true to the one-in, one-out policy. If you do find a great deal, make sure to get rid of its replacement item. Before you take to the stores (if you go at all), check out our list of tough questions to ask of new acquisitions. Today we welcome John Walton, author of the British travel blog Voyagers, to give us incredibly useful tips for auto travel. Welcome, John! This holiday season, with prices at the pumps lower but airline prices not really dropping, many of us are taking to the road instead of to the skies. But is your car, truck, or SUV ready for the trip over the river and through the woods to Grandmother’s house? Loose objects in your car can be more than just an eyesore. They’re potentially lethal projectiles if you have to stop suddenly. So use those little nets, compartments, and pockets wisely. Embarrassing holiday incidents shouldn’t include a coffee flask to the back of the head. Often, a messy car results from not having anywhere to put things away. When I downsized to a smart in 2008 it took me a while to figure out where to put my iPhone, water, and coffee. My tiny car doesn’t really have enough nooks and crannies, so I buckled a daypack-sized backpack into the passenger’s side seat belt so my stuff isn’t going anywhere if I have to slam on the brakes. Take a look around your local auto supply store for things that would be helpful. Beware the temptation to acquire things just because they are unique, though! You almost certainly don’t need a Purple Petal Mirror Muff, but one of those four-port USB chargers could be a great investment. If you’re going far, make sure that everybody in the car has something to keep them entertained. Before you leave on your trip is the time to load your gadgets with your favorite music or that thirteen-hour set of The Lord of the Rings. Lastly, and perhaps most important of all, be sure your vehicle is mechanically prepared for the season — whether you’re below freezing in Norway or Nebraska or sunning yourself in Argentina or Australia. Make sure you are comfortable driving in the weather conditions. Invest in a car emergency kit. Check your local automobile association’s website for tips appropriate to your region — and remember to check for your destination too, if you’re traveling! 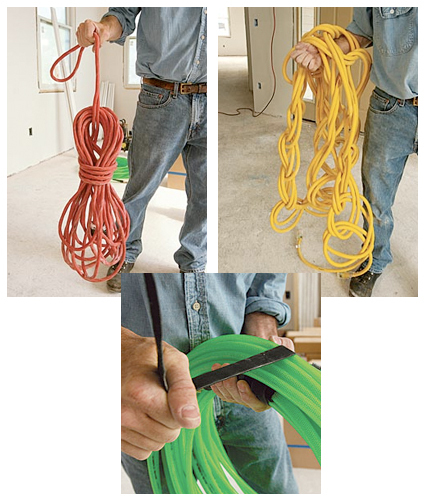 This advice is perfect for garden and air hoses and extension cords that are ready to be stored for the cold months. There are three methods described in the article: a looped bundle, a loose chain, and a reverse coil. If the pictures in the article don’t provide you with enough information, check out the instructional video that accompanies the article.